Hello, my name is Madison. I am twenty one and completely in love with music. Since my junior year of high school I have been ‘gigging’ as much as possible. My musical journey started catching fire at Potbelly Sandwich Shop, which is this super cute restaurant-meets-antique-shop kind of place. I love it there. I used to sit in the corner and play cover songs to customers as they ate their lunch. I got so much joy out of playing music for people that I caught this contagious performance bug. I love people. I love the stage. I love singing. Since then, I have played at many different restaurants, coffee shops, and festivals throughout Texas, Georgia, and Florida. I already feel like I’m living the dream. When it comes to my music, I am not particularly faithful to any one genre. As I write, I’m going back and forth between listening to Michael Jackson and Italian opera music (just to give you an idea!). I try to incorporate my love of lyrics and story telling with catchy pop hooks. So I guess I’m this over-smiley, super passionate country + pop + folk singer. My goal is to deeply connect with the people I interact with through my music. I love feeling close to people and having deep conversations. I feel so blessed by God for all of the opportunities He has already given me. I owe Him my life and my all. One of my favorite moments so far was watching my “Hey Soul Sister” cover video reach one million views on Youku (which is like the Chinese version of YouTube). Now, most of my fans are from places like China, Taiwan, and South Korea. All I can say is Wow, (!!!!!) thank you! Every time that song comes on the radio, I am reminded that impossible things can and will happen. I also dance wildly to that song and turn my speakers way up whenever I hear it… Thank you for giving me that. I’m a big dreamer. And sometimes that scares me. But I love music too much to walk away from this dream. What I want most in this world is to sing, just simply sing. And I figure if the world is willing to listen, maybe even sing along, I’ll have it made. For upcoming events click here. 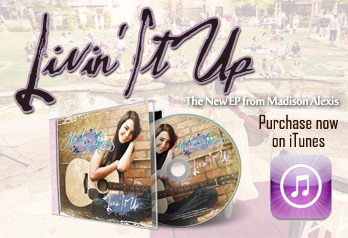 Stay in touch with Madison! Web Design by Nfuxion. ©2012 Madison Alexis. All Rights Reserved.